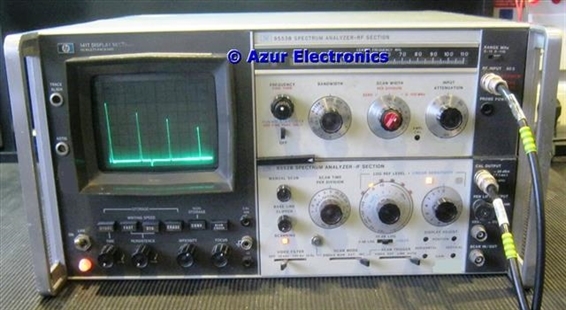 Understanding the HP 141T Spectrum Analyser is my first attempt at using spectrum analysis. Most of my test equipment is fairly easy to use and I have had previous experience with similar items and their applications. Spectrum Analysers are one (of the many) areas where I have little knowledge, although I appreciate their general function, so these are my working notes. 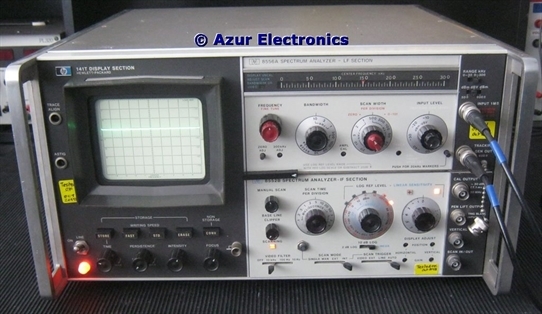 The Spectrum Analyser measures frequency against amplitude, unlike an Oscilloscope that measures time against amplitude. If you want to see a signal at say 1GHz, this is the way to do it. This Spectrum Analyser has a frequency range of 20Hz to 18GHz and an amplitude range of -130dBm to +10dBm. and HP 8552B IF Section plug-ins. 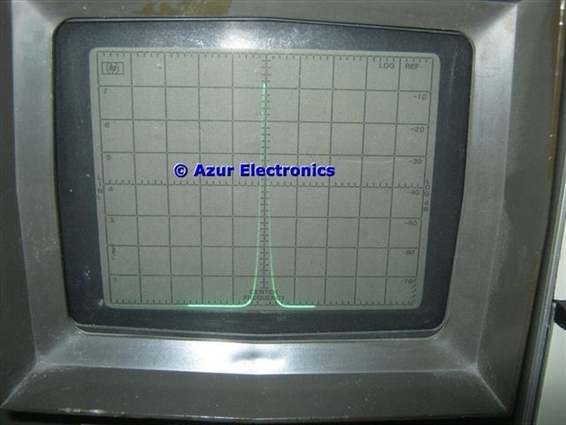 The CRT display is 8 x 10 with frequency horizontal, Log Ref levels -10dBm, -20dBm, -30dBm, -40dBm, -50dBm, -60dBm, -70dBm on the right hand side vertical and Linear Ref levels 7, 6, 5, 4, 3, 2, 1 on the left hand side vertical. There are various plug-ins available. The horizontal 'X' signal is provided by the HP 8552B IF Section which is the lower plug-in. There are 2 versions: the 8552A and 8552B. The B version is the higher specification and the one that I have. This has a scan timebase of 0.1ms to 10s. The vertical 'Y' signal is provided by the RF or LF Sections which are the upper plug-in. 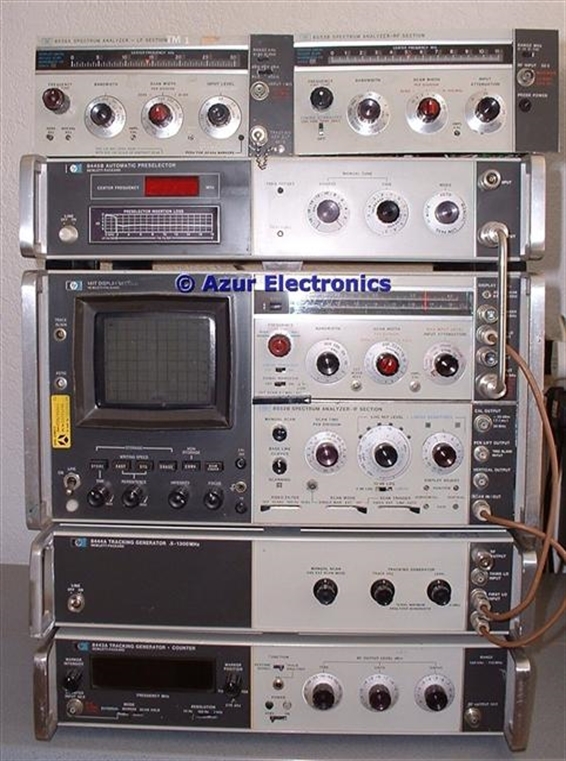 There are 4 versions: the HP 8553B RF Section for 1kHz to 110MHz; the HP 8554B RF Section for 100kHz to 1,250MHz; the HP 8555A RF Section for 10MHz to 18GHz; and the HP 8556A LF Section for 20Hz to 300kHz. I have all four of these Sections. There are 2, well actually 3, Tracking Generators. 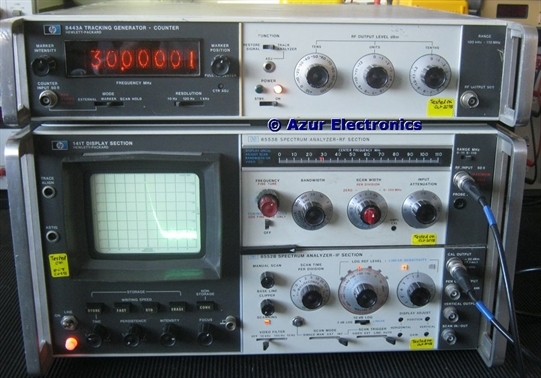 The HP 8443A Tracking Generator Counter for 100kHz to 110MHz and the HP 8444A Tracking Generator for 500kHz to 1.3GHz. The 8556A also includes its own tracking generator. The HP 8445B Automatic Preselector is a YIG tuned filter for use with the Spectrum Analyser 8555A (10MHz to 18GHz) RF Section. The Preselector can be tuned exactly to the Analyser's reception frequency and eliminates harmonic mixing image and multiple responses from 1.8GHz to 18GHz. Below 1.8GHz the image and multiple responses are eliminated by a low-pass filter. There are various special cables to inter-connect the equipment. These procedures calibrate the IF Section to work correctly with the RF and LF Sections as required. 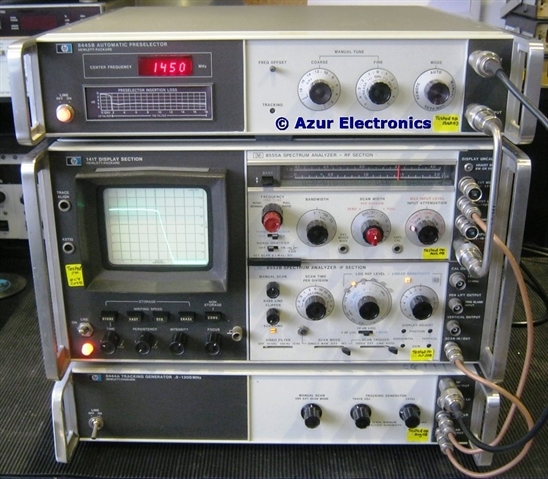 The HP 141T is a popular and versatile modular Spectrum Analyser. It is hardware controlled which means that complicated software menus are not used and what you see on the display has not been synthesised. Comprehensive Manuals provide detailed operating information. The HP 8556A LF Section has additional information available in HP Application Note 34 "Audio Frequency Measurements with the 8556A - 8552B Spectrum Analyzer". The 8556A operates over a bandwidth of 20Hz to 300kHz which covers the audio band and has its own tracking generator built-in. The HP 8553B RF Section operates over a bandwidth of 1kHz to 110MHz which covers the audio to FM broadcast bands. A separate HP 8443A Tracking Generator Counter is available. 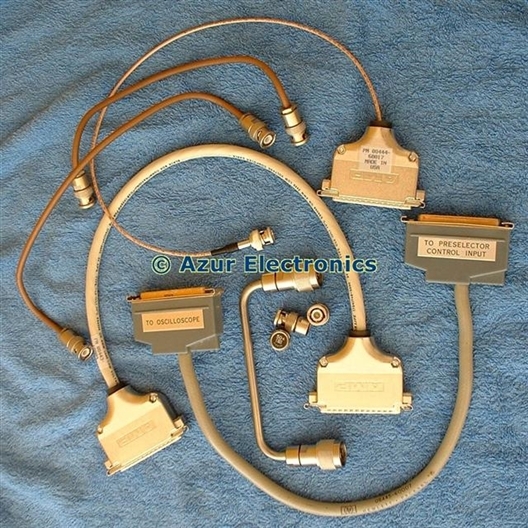 This requires the HP 08443-60009 Special Interconnection Cable to connect the HP 141T Aux A to the 8443A. The HP 8554B RF Section operates over a bandwidth of 100kHz to 1,250MHz which covers the VHF and UHF bands. A separate HP 8444A Tracking Generator is available. This does not require a Special Interconnection Cable, as there is no internal connection on the 8445B to the 141T Aux A connector. Instead 3 BNC to BNC cables are required for 1st & 3rd L.O's. and Scan interconnections. The HP 8555A RF Section operates over a bandwidth of 10MHz to 18GHz which covers up to the microwave bands. A separate HP 8444A Tracking Generator is available. This requires the HP 08444-60017 Special Interconnection Cable to connect the HP 141T Aux A to the 8444A, as well as 2 BNC to BNC cables. 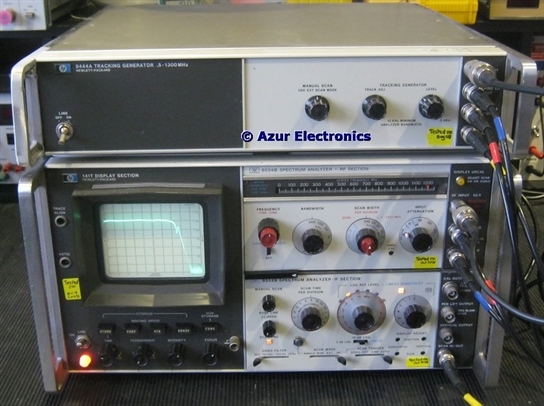 To really obtain the best measurement techniques out of this powerful Spectrum Analyser System, it is necessary to read the various Operating Manuals, all available for download.